Meet Diesel, a young Husky/Great Dane mix who is looking to find his furever best friend. Diesel is a fun loving boy who enjoys playing and cuddling. He is good with other dogs, loves everyone and will make a wonderful companion. He is still a youngster, so he is full of energy (for this reason, we recommend he be placed in a home with older children). When it comes to those quiet times, he enjoys laying at your feet or in your lap. Diesel has inherited the shorter coat of the Great Dane, but the markings and the enthusiasm to run from the Husky. Diesel was given up by his owners, who felt he had “allergies”. A trip to the vet revealed he had fleas, which were easily taken care of. With flea products readily available at the local vets, Diesel will have no more worries! Diesel is a smart boy ~ he knows “sit” and “come” and is eager to learn more. 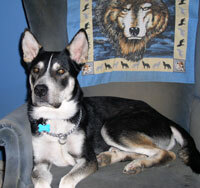 He will do best in a home that has the patience to train him and perhaps enroll in a basic obedience class for lessons. If you have the time and the love to have a new “Best Friend Furever” ~ Diesel is your boy!